Well, it’s not really a coat for Corduroy. It’s for his pal Lisa from Don Freeman’s classic book. 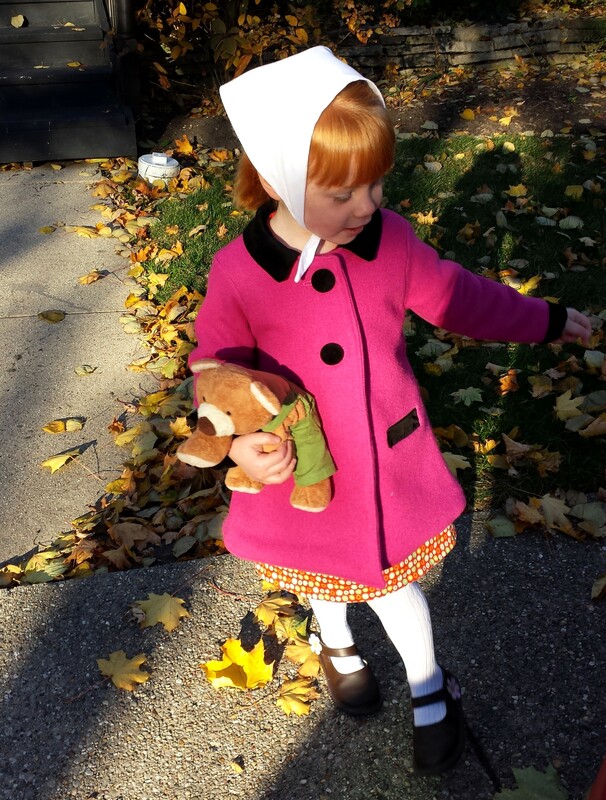 So, every year about two months before Halloween, Kiki talks about wanting to dress up as Lisa from the Corduroy story. 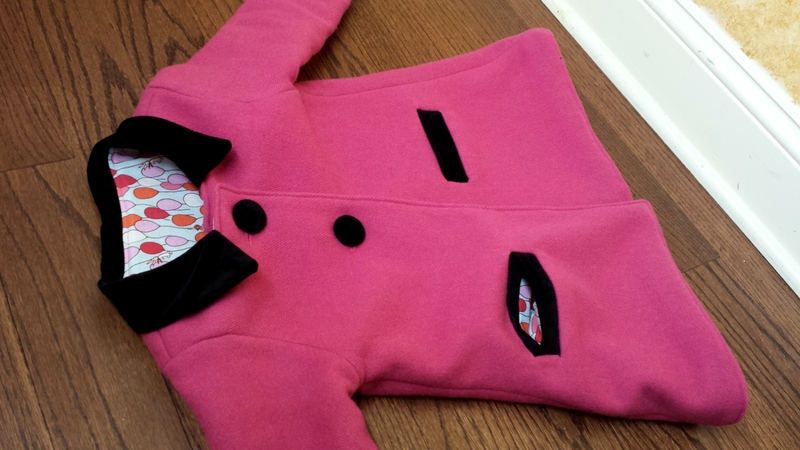 I always get really excited, because that means that I could try my hand at making that pink awesome coat. 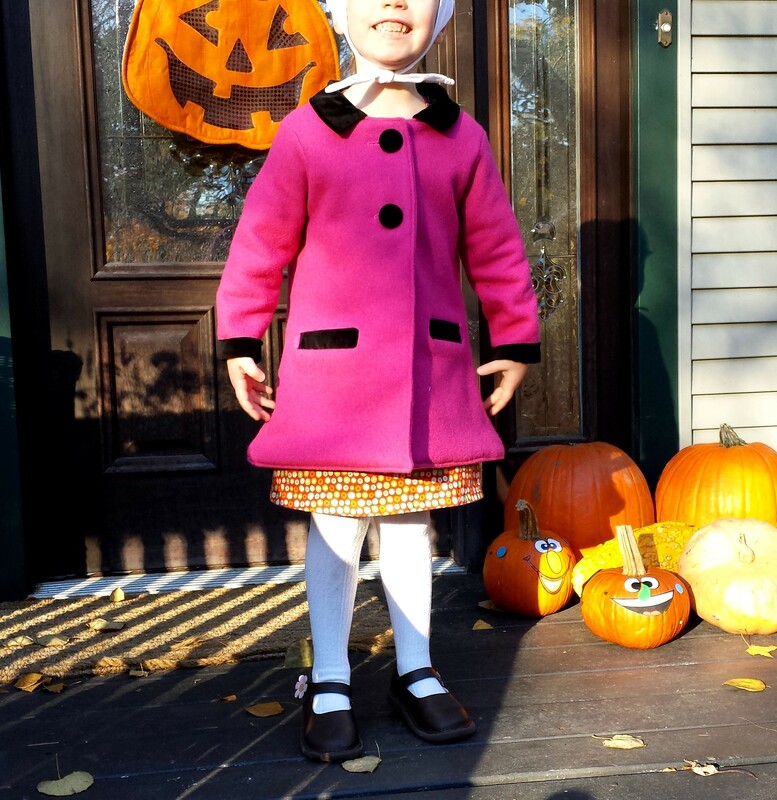 Then, a couple weeks later, she changes her mind and decides to be a doctor, a witch or Dora (as was the case this year). I sigh a sigh of relief that I did not make myself crazy trying to make a coat, which I have never done before, just to have the idea abandoned. This year, after Kiki decided to be Dora instead of Lisa, I thought to myself “Oh well, maybe next year.” Then, two pretty amazing things happened. Hmmm. 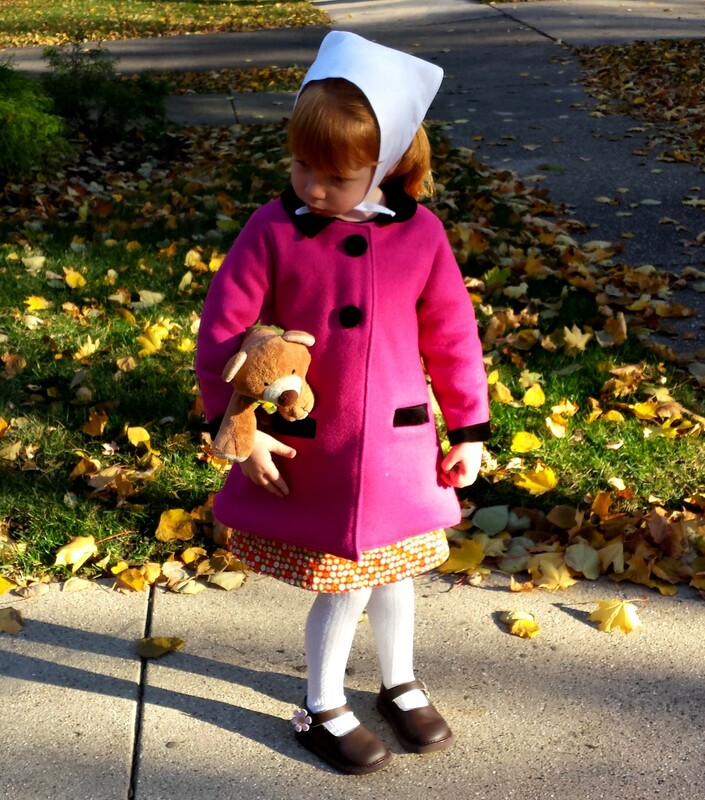 A Lisa coat is just about as Storybook as you can get. I started snooping around Etsy looking for vintage coat patterns, thinking that I might actually be crazy enough to try this. 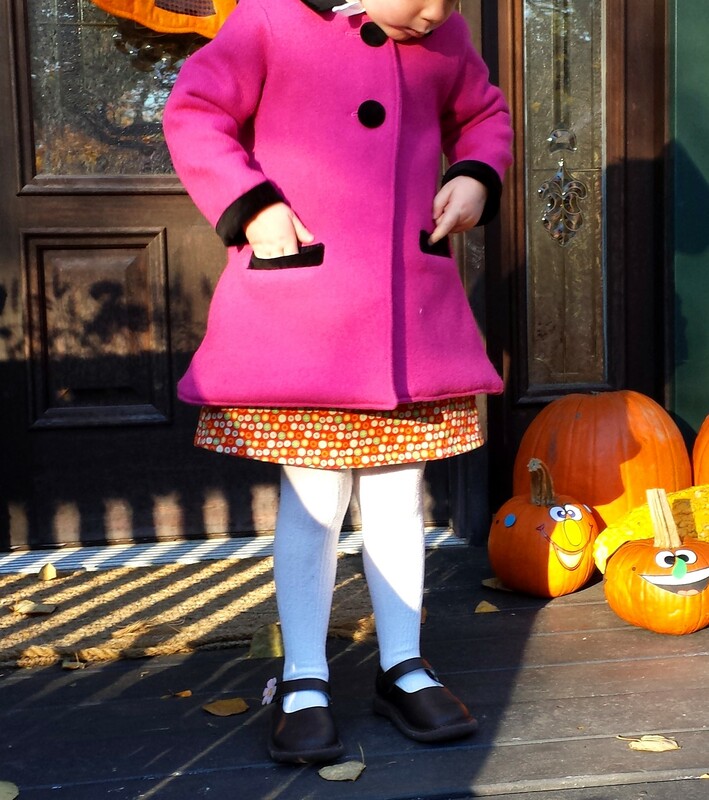 I mean, kids need coats even if they don’t wear them as Halloween costumes, right? 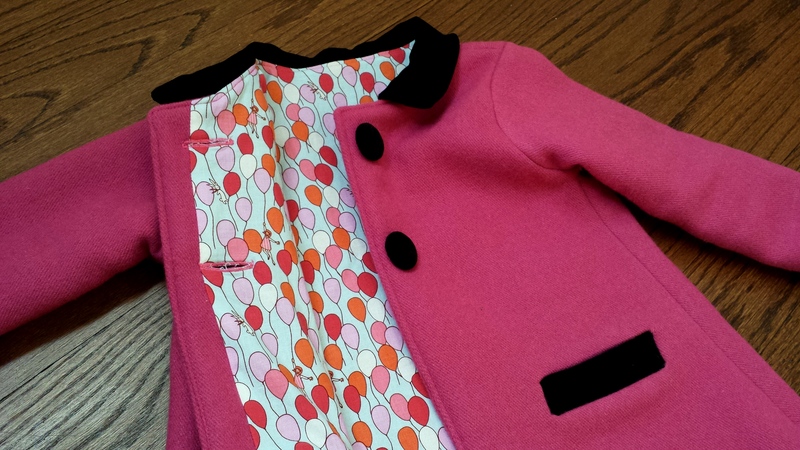 And then, Five & Ten Designs released their latest offering — Jackets! Fate does not need to whack me over the head more than twice for me to know that this was meant to be! If you don’t know about Five & Ten Designs, here’s the deal. 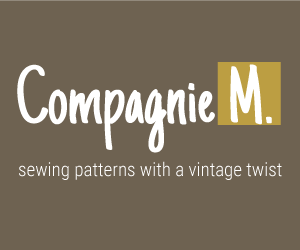 Five well known bloggers get together and make one basic pattern block. 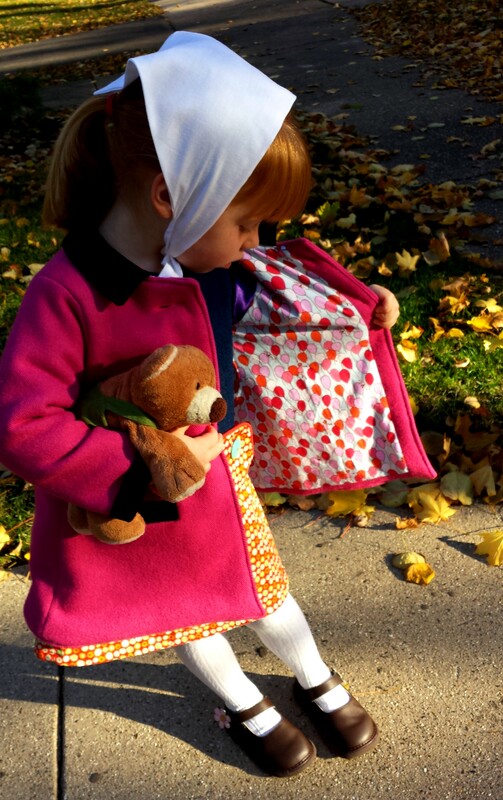 This time, it’s a jacket — a basic front, back, collar, sleeves, pockets & hood. Then, each of the five bloggers come up with two different adaptations of the basic pattern to make a total of five completely different jackets. It’s pretty darn cool. Aside from essentially getting ten different patterns in one package, it also shows you how to customize a pattern to make it all yours. That’s what I tried to do with this jacket. 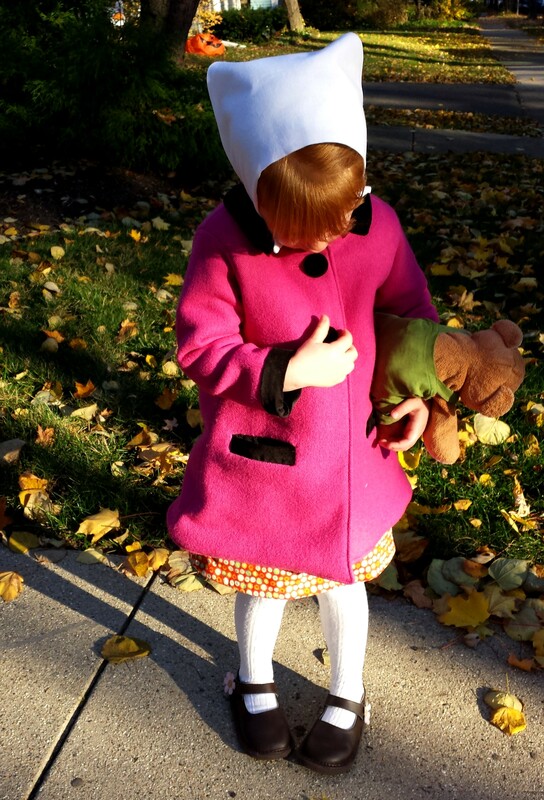 I took a look at the images of the coat from the book, and figured that I needed a coat that hits above the knee, has a black velveteen collar, pocket welts, buttons and sleeve cuffs, and flares out a bit in the skirt. 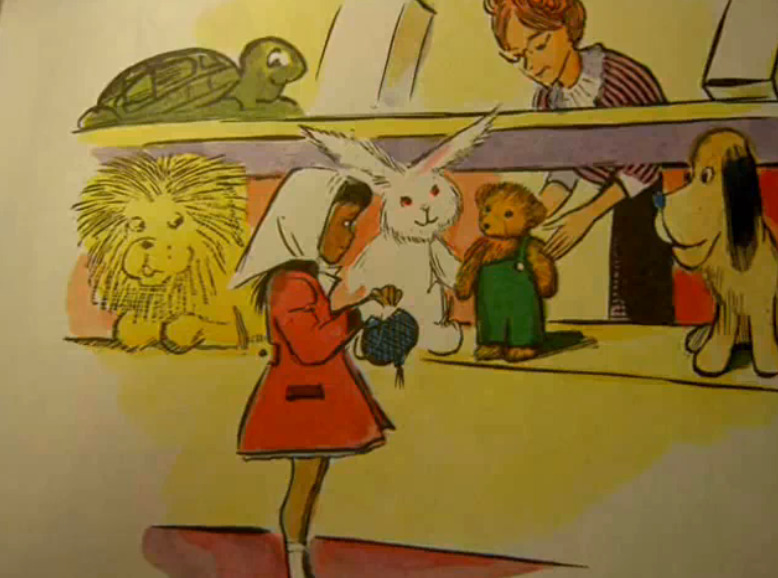 I showed Kiki some vintage patterns that flared out quite a bit, and her verdict was that they “look too much like dresses.” So, her coat would not flare out as much as Lisa’s original. And of course, there must be a kerchief. This became the most crucial element to Kiki. 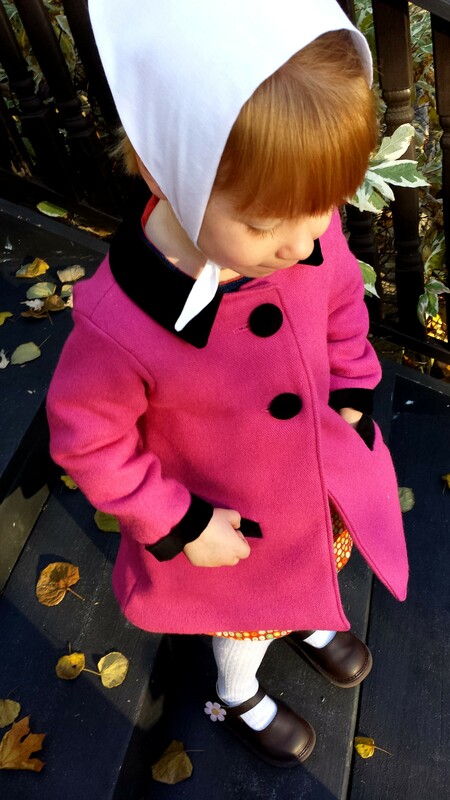 I just think she likes to say the word “kerchief.” Who doesn’t? Since none of the Five & Ten jacket designs included in the pattern package were exactly what I was looking for, I combined elements from looks #3 (the length), #5 (the placket), #8 (the flared shape) & #10 (the welt pockets) to make my own. I ordered wool in magenta from Mood Fabrics. When it arrived, I felt like the texture of the pile was too clumpy. It looked too much like an old blanket for my taste. But, the back side of the fabric looked great, so I sewed the whole thing up backwards! There was a bit of trial and error involved in this process, I have to admit. The outer jacket came together pretty easily. But once I got to the lining and facing pieces, things got messy. I had originally intended to line the entire thing with slippery purple satiny stuff (the purple at Kiki’s request). But, that slippery fabric is a total nightmare to cut. I’m sure there’s some trick to it that I don’t know — but no matter what I tried, I ended up with front and back jacket pieces that were in no way the right shape. The stuff shifted all over the place while I tried to cut it with both a rotary cutter and regular scissors. It wasn’t until after I had the facing pieces attached that I realized that I’d have to scrap the whole thing and try again. Grrrr. But then, I had a idea about how to save this sinking ship. I looked in my stash to see what kind of fun cotton print I might have on hand, and I found a big piece of Sarah Jane Children at Play leftover from Lulu’s birthday dress last spring. Yes! Recutting the front and back pieces out of this quilting cotton was like a dream come true after the previous slippery affair. I did follow Five & Ten’s advice of keeping the sleeves in the purple nightmare fabric, so that Kiki’s arms can slide in easily while wearing sweaters and such underneath. Somehow, the sleeve pieces were usable. Anyway, I think the balloons really kick it up, and Kiki loves them. By the way, if you are brave enough to sew with the slippery stuff, I highly recommend using a walking foot, especially if you’re sewing it onto fabric of a different texture. Seriously. The walking foot! The welt pockets were tricky, especially since I wanted to use contrast fabric inside the pocket (which is not included in the Five & Ten instructions). But Kristin’s tutorital on the Oliver & S website was a huuuuuge help! Thank you, Kristin! For those cuffs, I ended up loosely following Rae’s sleeve facing instructions from the Charlie Dress. I sewed the facings inside the sleeves with right sides together, then turned them out to the outside of the sleeves and hand stitched them down. The button holes should sit entirely on the facing/placket. Here, as you can see, they are almost 100% in the lining. Oops. I also didn’t put interfacing into the placket, because I thought it would get too thick between the wool. Turns out that it didn’t matter, since the button holes aren’t on the placket anyway 🙂 I globbed on the Fray Check and will keep my fingers crossed. Let’s just hope that Kiki isn’t too vigorous with those button holes and that they don’t come apart. I thought about going back in and fixing it, but that would mean taking the whole darn thing apart and ripping out button holes, and I just couldn’t bear the thought. I think this is just something you learn by doing, so I’ll know better next time. Lastly, I covered the buttons with the same black velveteen, sewed them on and called it a day (at about 1am!). Yes, Lisa’s coat has three buttons, but I only had two in my button drawer, so there you go. 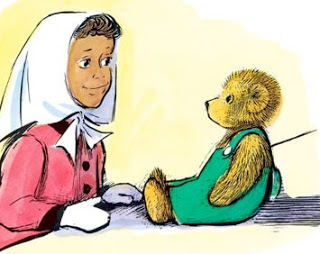 Incidentally, Kiki happened to have a bear wearing green overalls that I made last fall during a major Corduroy jag. Fate knocks once again. Hope you had a happy Kids Clothes Week. Now that it’s over, maybe we can finally get some sleep — if only we didn’t have those darn kids (hahaha).